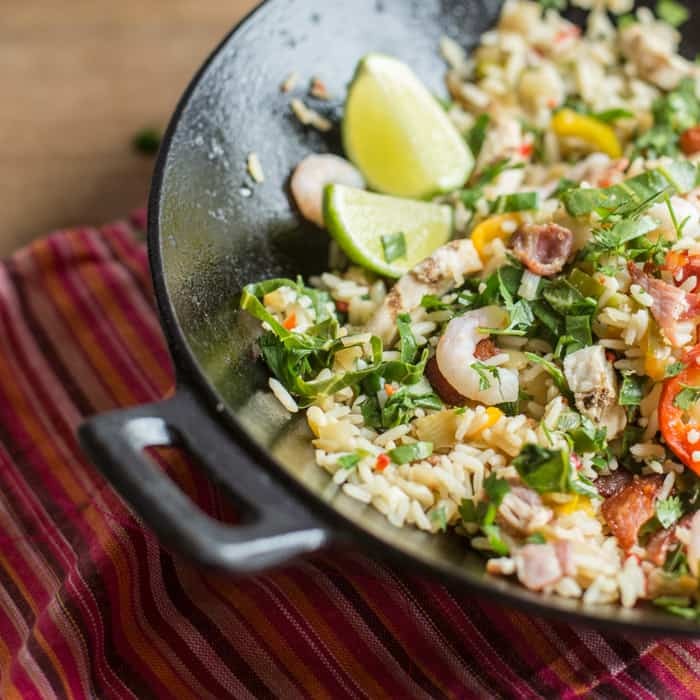 This Fully Loaded Special Fried Rice is a colourful dish that is perfect for rustling up at the last minute with most items coming from the freezer. Here’s my latest recipe for the #PowerOfFrozen campaign from Iceland. In this edition, I was tasked to ‘Cut the Hassle’ by creating a recipe that would save time and effort, without compromising on taste or quality. I always feel like I’m on a very laid back version of Supermarket Sweep when I create a recipe for Iceland. I get sent some vouchers and then leisurely stroll my local store looking for inspiration, whilst working out what I’m going to make. It was when I saw the frozen rice bags (I didn’t even know you could buy rice already cooked & frozen – what a time saver!) that my plan was hatched. A fully loaded special fried rice ticked all the anti-hassle & uber-tasty boxes. For £1 each I grabbed these two tubs in glee. 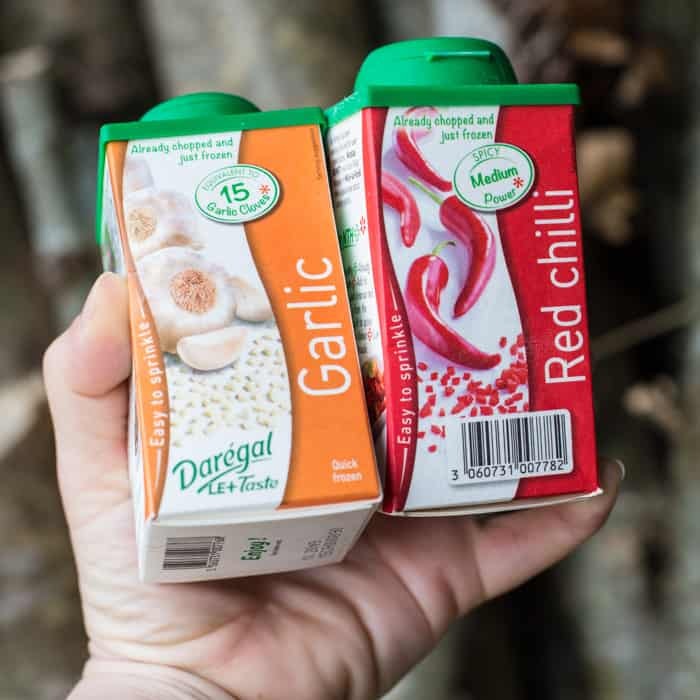 There are no preservatives or additives in either – just 100% garlic and chilli. They also do tubs of coriander & parsley, and are such a great idea to keep on hand for when you run out of fresh. And now back to the recipe… I used the veggies straight from the freezer which meant I didn’t need to add any oil as they contained a fair bit of water, however if you prefer you can thaw them all thoroughly first and ad 1-2 tablespoons of oil before adding the veggies. I did defrost the prawns and chargrilled chicken strips overnight although this can be done safely in the microwave. And if you have any leftovers, this makes a great packed lunch filler for the next day. As soon as it cools thoroughly, pop into lunch boxes and get in the fridge asap. Due to the rice, chicken and prawns be sure to take it out of the house in insulated cool bag with some ice blocks in to keep it safe to eat. Chop and fry the bacon until well cooked. Add in the onion, peppers, chilli and garlic and stir fry until cooked through. Add in the other ingredients and heat through well. Serve hot with some soy sauce and sweet chilli sauce added to taste. 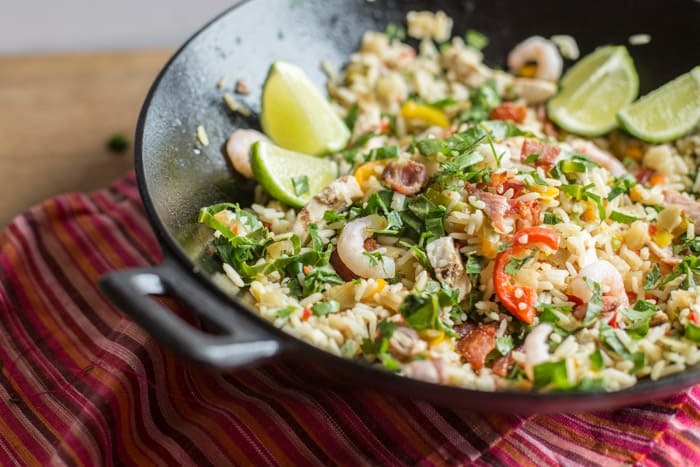 Claire shares her BBQ sardines with wild garlic salsa verde and couscous salad and a delightful BBQ waffle Smores, Bintu’s got a yummy 15 Min Thai red prawn curry on offer. Kate shares her Sweet Potato Cakes with Pea Puree and Choclette a Broccoli Cauliflower Cheese. My earlier #poweroffrozen recipes include these Chilli Beef Pies & the best curry I’ve ever made from scratch – this Hot Prawn Madras Curry, it’s deeeelish! Huge thanks as always to Iceland for sponsoring this recipe and helping me to continue bringing you tasty recipes, for free! As always all thoughts are my own. Fried rice is one of my favourite things to cook for the family. They love it and your version sounds like it’s packed full of great speedy ingredients. I need to get stocking up my freezer! 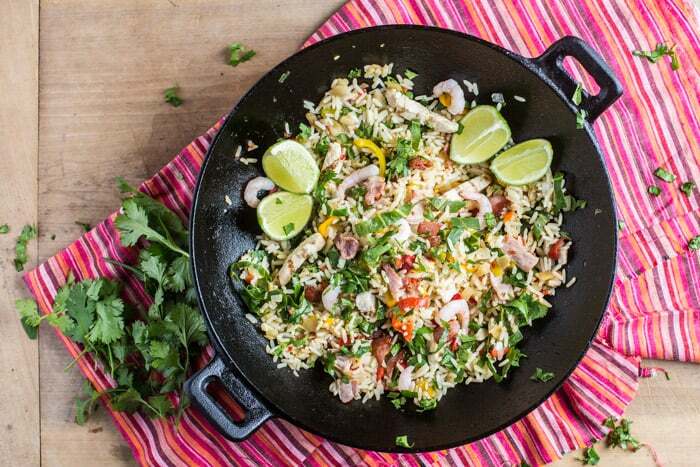 What a great way to jazz up rice! We always have those frozen pots of chilli and garlic in our freezer. They’re superb aren’t they Dannii, so handy of you run out of fresh. I must admit to never having shopped their in the past, but am certainly getting lots of inspiration there nowadays! Oh my gosh, you make me wanna drop everything and run to iceland to stock on these ingredients. Their range is very impressive. Hello Janie, thank you for helping us serve the most delicious fully loaded special fried rice. The recipe that you have provided is not only fabulous but it is also quite healthy and fresh as it contains fully loaded fruits and vegetables. Also, it is one of the most colorful dish that can be cooked even at the last minute from all that is stored up in the freezer.